a computer company which can provide web and mobile app that can perform instant messaging, image transfer, geolocation and video conferencing. Yannick Stéphane MBARGA ETOUNDI is a Doctor of Pharmacy and manages the follow-up of the HIV patients in the HIV Section at the Military Hospital in Douala, Cameroon. In addition, he is currently a Master’s student in Bacteriology and Virology at the Doctoral School of Douala University. 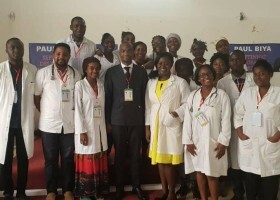 Yannick earned his bachelor’s degree at the Université des Montagnes in western Cameroon and completed his Doctorate of Pharmacy at the Faculty of Medicine and Pharmaceutical Sciences of Douala University in 2016, after which he scored first on the National Comprehensive Clinical and Therapeutic Examination. He received his military training at the Ecole Militaire Interarmées in Yaounde and currently serves in the Cameroonian army as Pharmacist with the rank of Captain at the Douala Military Hospital and as director of the Douala Military Hospital School of Nursing. Yannick created a mobile app to fight the phenomenon of counterfeit medications and founded a web- and mobile-based telemedicine platform (idocta.cm) to render existing health professionals more accessible to patients. He has also collaborated with Yale University and MSF/Epicentre in the implementation of research on malaria and non-communicable diseases.